Solve a Rubik’s Cube and Impress Your Friends!Inside How to Solve a Rubik’s Cube, you’ll discover simple, easy-to-understand instructions for wrapping your brain around this fascinating and intriguing puzzle. Even if you’re a complete beginner, you can easily solve one of the world’s top-ranked and most-beloved puzzles – in the wink of an eye!For over 4 decades, people have tested their minds against the Rubik’s cube – invented by Erno Rubik, a Hungarian architect. Many impressive thinkers have worked with the cube, including names like Etter, Sbahi, Hays, and Thai. You can join the Rubik’s cube community (called “cubers”) and learn how to improve your mental skills, brain activity, and dexterity!With this book, How to Solve a Rubik’s Cube, you can access a layer-by-layer solution to this classic puzzle:Solve the Upper FaceOrganize the Middle AreaComplete the Yellow Faceand Finish the PuzzleYou’ll even discover illuminating, full-color pictures for fully grasping Rubik’s cube terms and strategies!Finding the solution to a Rubik's Cube isn't a Mystery – It's a fun hobby!With this comprehensive guide book, you’ll even learn Rubik’s cube terminology for understanding the structure of the cube – and sharing your passion with other cubers. You’ll learn the basics of a simple and powerful Rubik’s system, including a special code for easily identifying the various movements you can make. With these easy-to-use mental tools, you’ll soon be seeing deep into the cube – and its 3D mysteries.By grasping the clockwise and counterclockwise movements of the Rubik’s cube, you’ll discover how to think in many directions – and from many perspectives. While you learn to navigate this unique 3D environment, you’ll also learn to see the world around you in a new way. Just like the architect who created this game, you can develop your mind to see things from every angle! 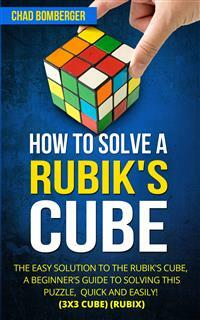 Chapter 3: Getting Started: Why Solve Rubik’s Cube? The content and information contained in this book has been compiled from sources deemed reliable, and it is accurate to the best of the Author’s knowledge, information, and belief. However, the Author cannot guarantee its accuracy and validity and cannot be held liable for any errors and/or omissions. Further, changes are periodically made to this book as and when needed. Where appropriate and/or necessary, you must consult a professional (including but not limited to your doctor, attorney, financial advisor or such other professional advisor) before using any of the suggested remedies, techniques, or information in this book. You agree to accept all risks of using the information presented in this book.